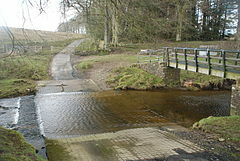 Rawney Ford on the Bothrigg Burn, a tributary of the White Lyne in Cumbria, England. Usually none (natural, preexisting), but sometimes supplemented with concrete or asphalt for vehicles. ↑ Shri Lallan Prasad Sinha. Sitamarhi Charit. Prabhat Prakashan. पप. 1–. ISBN 978-81-7721-387-4.